2013 Outlook: Part 11: Should I Buy US Stocks Today? 2013 Outlook Part 2: What Is A Bond? 2013 Outlook Part 3: How Did We Get Here? 2013 Outlook Part 4: Can You Lose Money In Bonds? 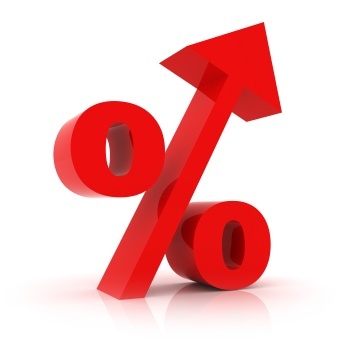 2013 Outlook Part 11: Should I Buy US Stocks Today? I try to spend time reading a very wide range thoughts from intelligent and respectable analysts on the financial markets. I also try to take the time to study every argument with an opinion from both sides. 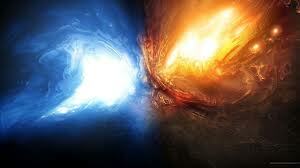 Einstein once said that "the test of a first rate intelligence is the ability to hold two opposing ideas in the mind at the same time and still retain the ability to function." This may sound silly at first, but I assure you it is far more difficult to accomplish than it appears. The natural human instinct is to seek out information that confirms what you already believe, instead of seeking out information that argues against it. This is why you find people that come to a conclusion and put out a forecast only read authors that agree with that forecast. It is always my goal to do the exact opposite. I want to have as much information as possible in my head competing for the final analysis. *Where else will investors put their money to get a good return? All these points are valid and worthy of discussion, and I will go through each below. Many of the analysts that recommended shorting stocks in 2009 now enter 2013 with the belief that we have begun a new long term bull market, after the market has risen well over 100% in price. I have been bearish on US stocks since the start of 2010 when they crossed about 10,500 on the DOW. At that point I felt both owning US stocks or purchasing new shares did not provide enough margin of safety based on what I felt was the true strength of the economy. I recommended to investors who I help manage money that they sell stocks and put that money into "safe cash." (I will discuss safe cash in a coming section). At certain points over the last three years I have determined points of extreme euphoria in the market and documented them here on the site (see Inside The Mind Of A Tuna: How I Invest & Why). I let investors know that it would be a good time to apply a short position in the market (with speculative money) and then close that short position when stocks fell and the euphoria passed. This has provided short term profit opportunities while we watched stock prices run and run and run higher sitting in cash. For a quick and easy explanation of what shorting stocks means see Understanding Shorting Stocks. Today, 3 long years later and over 3,500 points higher on the DOW (which just crossed back over 14,000 this week), I fully understand that both I and the people I help invest have "missed" this portion of the run. Along the way the safe cash continues to be steadily deployed into other assets when buying opportunities emerge, which have outperformed the general US market. As a recent example see China's Stock Market Continues To Plunge: Buying Opportunity? (China's market is up close to 20% since that publication). In the media and the online world of finance, everyone that was in agreement with me in early 2010, all those that were cautious on the US stock market and sitting on the sidelines, have now left. So they question is, do I think this is a good opportunity to join them and put money into the US stock market? The answer is no. I am now more bearish than I have ever been. Before we move on to how the scope of this outlook, how the major paradigm shift in interest rates will impact this specific asset class, let me quickly review the current state of euphoria in the stock market today. I believe sentiment is the second most important tool an investor can use to make an investment decision (after price/value calculations). For more on why that is, I always recommend investors briefly review the discussion in 2012 Real Estate Outlook: The Fall. 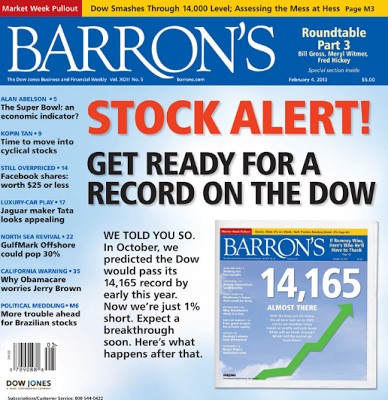 To get things started we have this week's cover of Barron's magazine which provides, without words, the jubilance in the air. As a reminder, here was the cover on March 9, 2009 (the week that stocks bottomed). The mood was beyond dour. 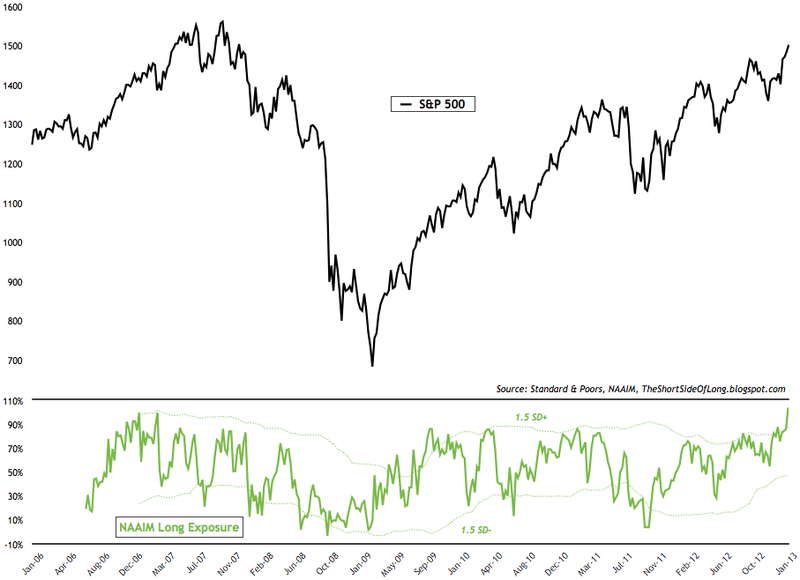 The most recent response (shown in the green line below) came in at 104% long, a new record long position in the survey. This means that fund managers have moved beyond putting 100% of their investment capital into the stock market. It is the equivalent of your next door neighbor putting 100% of his retirement money into the stock market, then coming over to your house and asking to borrow money so he can buy more stocks. According to Short Side Of Long, and this number is staggering, the most bearish participant in the survey was 60% long stocks! 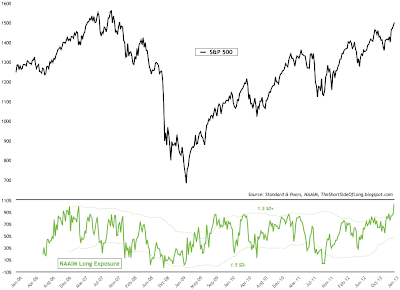 The next chart provides an average of a large number of sentiment indicators in the market (price, momentum, safe haven, breadth, junk bond demand, put and call options, and volatility). It shows the markets currently have the most amount of greed and the least amount of fear in the history of the survey. 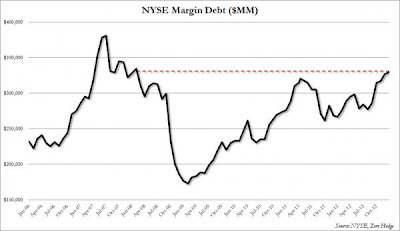 Margin debt at the NYSE is now back at levels seen in May 2007. This is the amount of borrowed money used to bet stocks are going higher. Before we move on I want to briefly remind readers what happens when investors are long with leverage and assets unexpectedly move in the opposite direction. They are forced to sell other positions on their books in order to make margin calls. This process has a self re-enforcing ability to create a waterfall type event across all assets - specifically the most liquid. This is why stocks tend to rise slowly for years, and usually have a free fall type movement over a short period of time when they reverse. 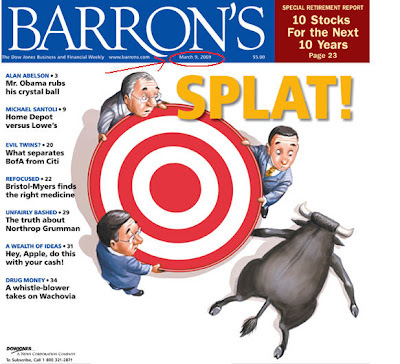 A good example was seen clearly in the fall of 2008 as everyone was caught off guard and leveraged long. The Market Vane bullish consensus has reached 69% bullish, the level last seen at previous major tops. The investor's intelligence survey is at 52%, a two year high. Next up we have the VIX, or the fear index. It has hit levels not seen since early 2007 meaning that investors see absolutely no risk anywhere in the market right now. 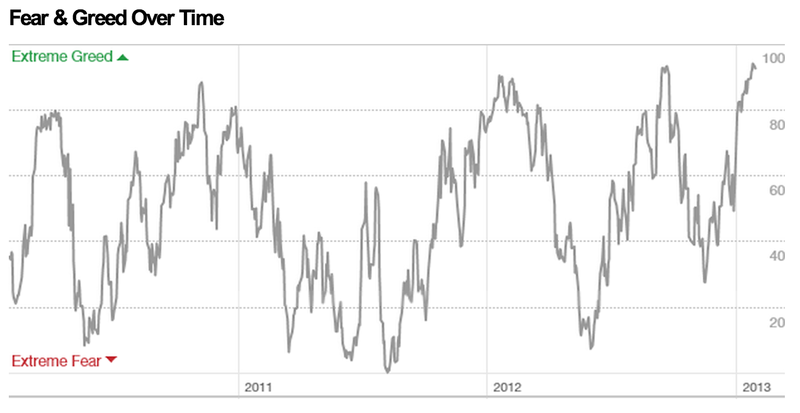 The AAII poll of individual investors has more bulls than bears than any time over the last two years. One of the arguments above from the bullish camp is the money coming off the "sidelines" from the average investor into mutual funds. To start the year we saw the second biggest week of fund flows into the stock market ever. The first came in late 2007 at the previous market top. The first 3 weeks of the year saw a total of $14.9 billion enter the market, the largest for any period since 2001. These gauges show that market has moved beyond cyclical points of optimism during the last few years to levels of euphoria found at the two previous major tops. Those that have been involved with the stock market for more than a few years can remember how the media and fund managers viewed the market in 2007. As unimaginable as it seems, we have moved right back into that world today. Looking beyond sentiment one can argue that the world is a better place today than it was back in early 2009 justifying the current stock prices and valuations and much more room to run higher in the years ahead. But is that true? The following chart shows the S&P 500 vs. consumer confidence. The US consumer has been the backbone of the economy for decades. 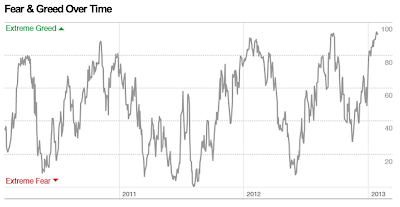 This is why consumer confidence and the price of stocks have always tracked each other consistently. The question is, has something changed in this dynamic? No reforms were made after the previous crash to move the US economy's dependence for growth away from consumption, yet stocks and consumer confidence have recently diverged. The average American who purchases goods is saying that things are far worse than the stock market has them priced today. These points will converge again in the future, it is only a matter of where you believe that convergence will take place. How about price to earnings valuations? David Rosenberg recently noted that the S&P 500 has traded up to a 14x P/E multiple with today's rosy earnings and expectations. Earnings per share projections are for a 10.3% year over year profit surge in quarter 3 and a 16.7% profit surge in quarter 4. This comes at a time when profits from the fourth quarter are disappointing expectations and new tax increases, Obamacare, and the coming debt ceiling compromise are on the table for 2013. In other words, investors have priced in growth beyond perfection at a time when higher taxes could trigger a major slow down. Can stocks move higher even if earnings stagnate or fall? Of course they can. An investor can bid any asset up to a higher level (as seen in the discussion on the prices being paid on commercial real estate buildings in the previous section). P/E levels moved to astronomical levels back in early 2000. Can they move back to those points of overvaluations again? Of course. Will I buy stocks today on the "hope" that happens again? What about the Fed? If there are $85 billion in freshly printed bills entering the financial system every month, that has to help stocks right? To understand why on a fundamental level that inflation does not help stock prices (in fact it directly hurts them - review charts from the 1970's) see The Dark Side Of QE: The Next Chapter In Our Story. Beyond just the fundamental principles of why QE does not help stocks, you need to also understand that investors do not have to put printed money into the US stock market. 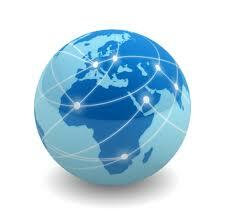 They have put a large percentage of capital into the US market up until now, but that can change at any moment. The Fed has the ability to unleash an unlimited amount of money, but they do not have the ability to determine where it goes after it is unleashed. 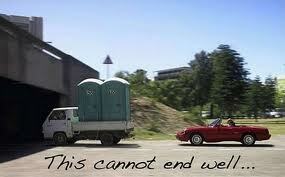 It is like dumping water down a stream. The Fed "hopes" that 100% of the money ends up chasing US stocks, real estate, and bonds, creating a wealth effect for consumers. However, money will go where it is treated best. That could be Chinese stocks, oil, agriculture, gold, Brazilian real estate, Canadian government bonds, or any other asset on the planet. There are no boundaries in the financial world today, and money moves and flows at the speed of light into different assets around the world. What about the "money on the sidelines" that has been building up as the average American has exited stocks and moved into bond funds over the last 5 years? The consensus view is that this money will "rotate" back into stocks and push the market back into the stratosphere. The problem is that there is not just a big pile of money sitting somewhere. They are not in "cash" funds, they are in "bond" funds. For every buyer of an asset there must be a seller. The major reason there has been a larger increase in bond holdings over the last 5 years is that there has been a massive new supply of bonds entering the market. This has in large part been due to the enormous Federal spending programs put in place to counter the current depression. If everyone sells bonds to buy stocks, who is going to buy the bonds that are sold? That brings us back to the final part of this discussion, which brings everything full circle back to where this outlook began. The steady stream of new supply of debt (bonds) entering the market has been relentless, and it appears to have no signs of slowing in the years ahead. The financing for this debt has been easy so far because the government has had both the average investor looking for "safety" in bonds and the Federal Reserve's QE programs. Every bond that has entered the market has met open arms, and this process continues today. The coming "rotation" out of bonds that everyone so desperately wants would trigger the start of the coming debt crisis. As bonds are sold, rates will rise. This will trigger problems in almost every area of the economy. We have already discussed how it will impact the real estate market. It will also raise the cost for companies to borrow money for growth. It will raise the cost for local governments to finance their debt. It will raise the cost for Americans to go further into debt to continue to purchase goods. People will not understand how much the recent years of rates falling have masked the true underlying economic problems until that process begins to move into reverse. In addition, what would happen if some of that bond money decided not to rotate directly into stocks as everyone predicts it will. 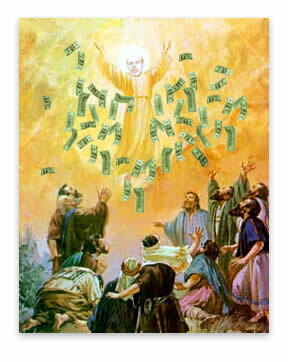 As we just discussed, money can move anywhere. A bond sold become cash. That cash could then be used to purchase oil, copper, steel, agriculture, or natural gas - essentially the underlying goods that make up the every day cost of living. Americans have not experienced a surge in employment or salary during the recent stock market surge. The income side of the American consumer's balance sheet is far worse than it was during the recent stock market high of 2007, only the debt is still there like a noose around the neck. A rise in the cost of living today would further reduce the ability to spend on discretionary goods at a time when the ability to borrow money to buy these goods is either disappearing or becoming more costly. This creates less demand from the final consumer of the goods for the companies that make up the DOW. Looking directly at the balance sheet of corporations, a rise in the cost of goods cuts directly into their profit margins before they even have a chance to enter the market. During the current artificial recovery everything has worked perfectly for the Fed, which is why they are considered "god-like" in the market today. The money has gone exactly where they wanted it to; bonds and stocks, while inflation has remained very low. This has allowed them to become more and more brazen, perhaps even believing that they are god-like, announcing that they will print $85 billion every month, forever, until the unemployment rate hits 6.5%. In reality, this period of complacency has set the global economy up for the biggest disaster in history. I hope you can now see that as we are at the dawn of this disaster, the final chapter of the 70 year debt super cycle, most investors have their all their bets pointed in the wrong direction, with leverage. This always occurs right at the moment when things change due to human psychology. How should one be positioned at this important moment in history in order to protect their capital during the change and be prepared to take advantage when fear returns to the market. That is what we will discuss next. Before we move on I want to briefly provide you with two paragraphs from this week's Barron's magazine cover story (cover above). I hope you will now have a different perspective on the analysis. The emphasis is mine. The party is far from over. The early-year rally that on Friday took the Dow Jones Industrial Average to within 1% of its record high, set in 2007, could have a lot further to run. For starters, stocks aren't expensive. The Standard & Poor's 500 index is valued at about 14 times estimated 2013 profits and the Dow fetches less than 13 times projected 2013 earnings. At the market peak in 2007, the Dow traded for 16 times forward earnings. Given ultralow interest rates, the market multiple has room to expand even if earnings growth remains modest. There's a huge amount of money that could shift into stocks because individuals until recently have favored bonds over equities, based on mutual-fund flow data. "If there is a great rotation going on from bonds to stocks, we may be only in the top of the first inning," says Jason Trennert, chief investment strategist at Strategas Research Partners in New York. Trennert cites the TINA -- or "there is no alternative" -- factor, as yield-starved investors move into stocks. We seem to be living in interesting times and a lot of parallels are being made between detachment of the current economic system from reality and previous global shifts (Great Britain post WW1, USSR circa 1989). Tuna what is your take on FED starting to increase the rates early this year? (contrary to what they promised). It seems to me that the mood in MSM is one of jubilation and unlimited risk appetite. The Fed just might increase the rates since things are "going so well" in our economy. Might you publish a separate outlook regarding rates going up now in this climate of "sure economic recovery". I don't think they will move rates this year unless they are forced to due to some commodity type spike, which I don't think is coming in 2013 (but will in the years ahead). They are just using words now to try and keep inflation expectations under control. The Fed is actually backed into a corner in terms of where rates are today and the size of their balance sheet. In order to raise rates they must sell bonds back into the market in exchange for cash. The problem is they have bought these bonds at the all time high in price. If they are a seller, their entire balance sheet immediately moves under water. And who would be the buyer of all these mortgage and treasury bonds? The Fed is currently purchasing the equivalent of the entire annual US deficit with their QE programs. They cannot raise rates the way they did in the early 1980's because of the size of the debt outstanding. If rates rise, just like in Japan, it would overwhelm the annual interest cost for the federal government. They are trapped. This is the endgame. If this is an end game, what are the clues or indicators one needs to be keeping a close eye on? Will it unravel so fast no one will have time to get out? The first tremor will appear in the derivatives market through something called interest rate swaps. The public does not have access to this market, only large hedge funds and banks, so it will be like a summer of 2007 type situation where you see the markets and volatility pick up but it is difficult to locate where the trouble is coming from. That, I believe, will be the initial trigger that we will be able to look back on years from now as the start of this round of the story, similar to how we can now look back at that week in August of 2007 as the initial trigger for the subprime crisis.